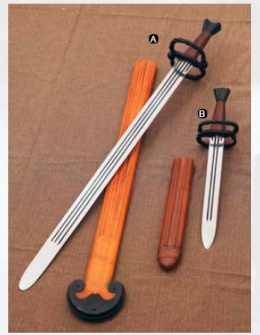 A: This katzbalger sword possesses a hand crafted steel blade, set with straight, unsharpened edges and adorned with three fullers, which run down a majority of the blade, helping to keep the weapon light. The tip is rounded, for safety and for authenticity, as the katzbalger was primarily a slashing weapon. The blackened steel guard echoes a braided figure-eight shape, which helps to protect the hand, should a blade slide down during a clash, while the grip is made entirely from wood. Included with the sword is a matched wood scabbard, with a unique shape and fitting at the chape. B: This Landsknecht Katzbalger Dagger echoes the look of its bigger cousin. Like the original katzbalger sword, this smaller dagger possesses iconic features, including a wood grip and a figure-eight guard. The recreations steel blade is hand crafted from EN45 carbon spring steel, with straight, unsharpened edges, while also featuring four fullers (two short and two long) down its blade. The blackened steel guard has a twisted design and is hand forged. The Signature Sword of the German Landsknecht, who were colourful mercenary soldiers with a formidable reputation who became an important military force through late 15th- and 16th-century Europe. Consisting predominantly of German mercenary pikemen and supporting foot soldiers, they achieved the reputation for being the universal mercenaries of early modern Europe. This page was last modified on 11 June 2014, at 19:09.